And finally, here we are, chapter 4 for reals. Let me tell you, this one is gonna be fun. Hey did you know that on Patreon we are doing all Halloween and Horror-themed updates this month? We already started with a mini comic of Lawrence’s halloween costume whe he was still in university and its nerd-tastic. Check us out! Zero other patrons. Apparently everyone else agrees with Bobby about the food. 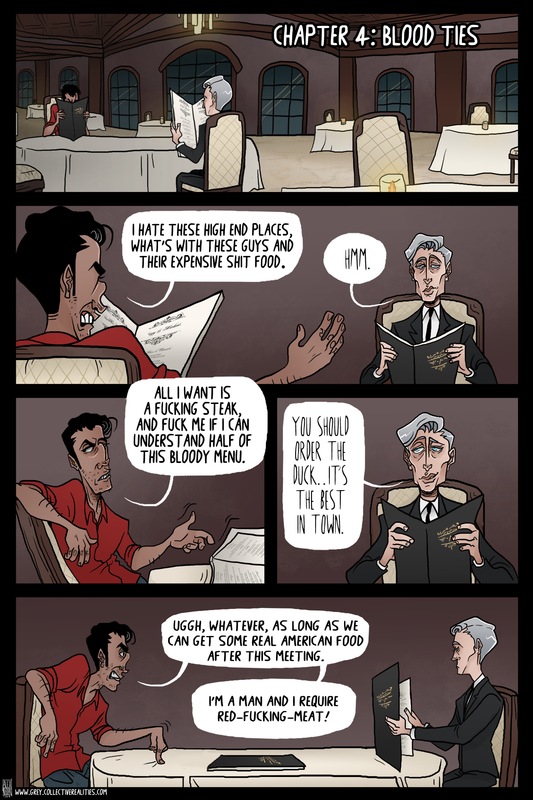 it almost looks like boss booked out the whole restaurant so that he and bobby could eat alone. I love how you can see Bobby’s angry eyebrows over the menu there. I don’t blame other people tho – I wouldn’t want to eat at the same place as them either.